Lurking along the plane of our Milky Way galaxy are invisible monsters comprised of dark gas and dust of epic proportions. These “monsters” are dark clouds of dust that are so dense that they absorb the light of the stars behind them. Astronomers refer to these cosmic silhouettes as “Dark Nebulae”. Many Dark Nebulae are regions of intense star formation, as the dust condenses down into new-born stars. Although the background of the image appears as a solid yellow wash scattered with stars, what you are actually seeing is tens of millions of yellow main sequence stars swirling around the central region of our milky way. Dark nebulae are present in nearly all spiral galaxies. 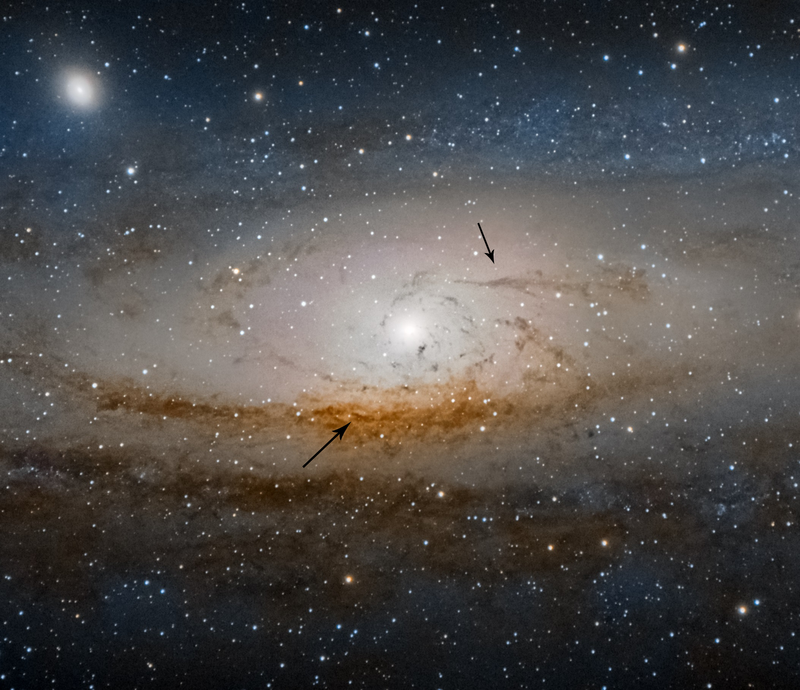 Here is a crop of the core of my M31 picture with arrows pointing out some dark nebulae. Most of the Milky Way’s Dark nebulae are cataloged under the Barnard Catalog. This particular nebula is the 78th addition to the Barnard catalog and is the southern part of the larger Dark Nebula know as the Pipe Nebula. I hope to capture more examples of dark nebulae later this year at the CalStar star party.